My Minds Eye In Bloom cards…. I am sorry I have been missing all week, but it has been horrendously hot here this week, and all any of us can do is find the coolest spot and just stay there! They tell us we have had a cool change, but it is 35C today, and that is still hot in my book!Anyway enough of that and on to today’s cards…These ones are made with papers from the My Minds Eye In Bloom collection, 12 x 12 papers, and /or the 6′ paper pad from the same collection. 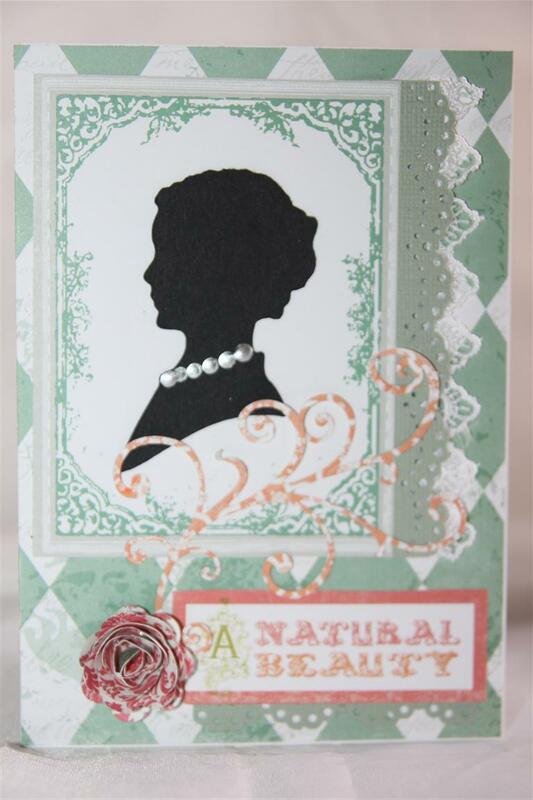 The papers are so gorgeous the cards really didn’t need any more embellishments. I loved this collection so much I actually framed one of the 12 x 12 pieces and hung it in my hallway! Heat or not today i amd definitely going into the craft room for some craft time!Til tomorrow….. 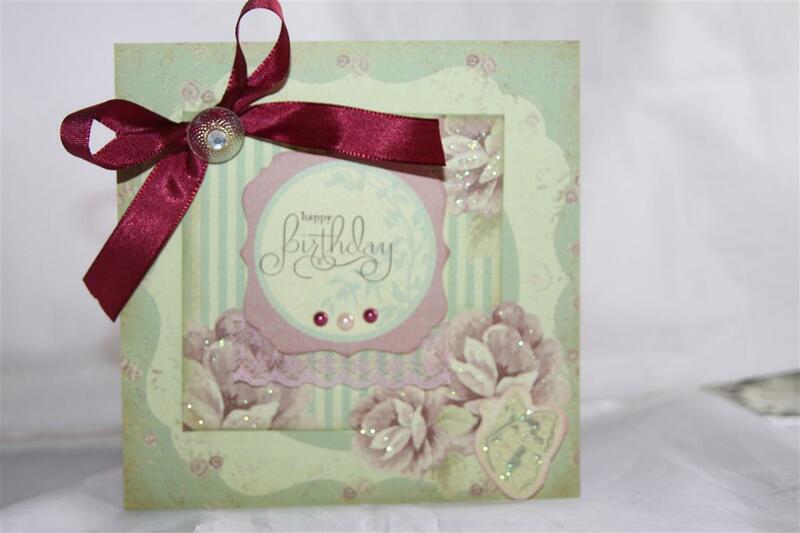 I named this post after the stamp set I used to create this card, but there is so much more going on! After I had fussy cut out the window I stuck it onto my card base which i had covered with a scrap of paper – it reminded me of wallpaper… then I made my chest of drawers using spellbinders label seventeen dies, and for the drwaers Modern Label punch ( stampin Up) and added liquid pearls for the drawer handles.I inked around all parts of the drawers with brown ink Then it was time to move on to the vase of flowers – a circle punched out with a 1 inch punch, and trimmed off top and bottom, and flowers and leaves punched out with various punches. I do like creating these type of scenery cards, and this one was a retirement village lesson, which all the ladies enjoyed! Tonight I plan to tackle some male themed cards, I have rediscovered my motorcycle stamp, and have some ideas…Til tomorrow…. 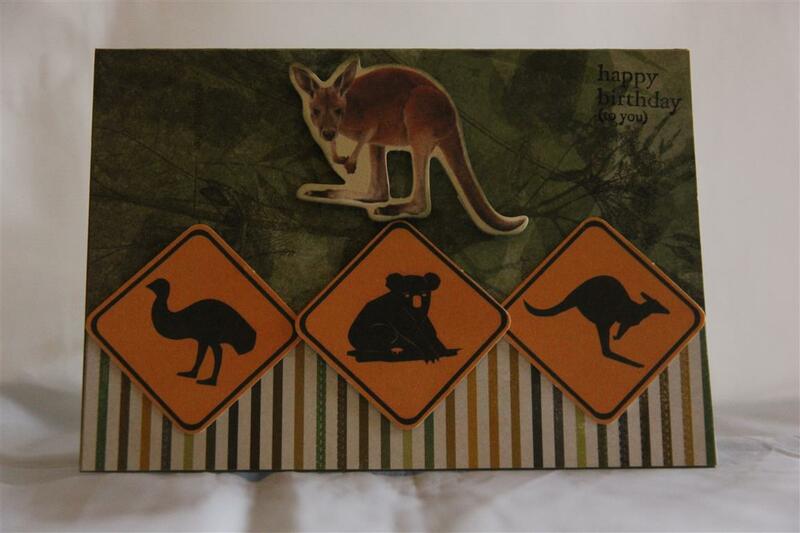 This photo is a little dark – in real life the background isn’t quite so dark, the paper is from Kaisercrafts Great Southern Land collection and I used the matching collectables as well. This was a release in the second half of last year, but it should still ba available. I used it for a class last september, and we all thought it would be good for xmas cards to send overseas.this one though I have made into a birthday card stamping a stampin up sentiment stamp straight onto the paper.I will be found in the craft room tonight as I have a few orders to make including quite a few wedding cards! Til tomorrow…. 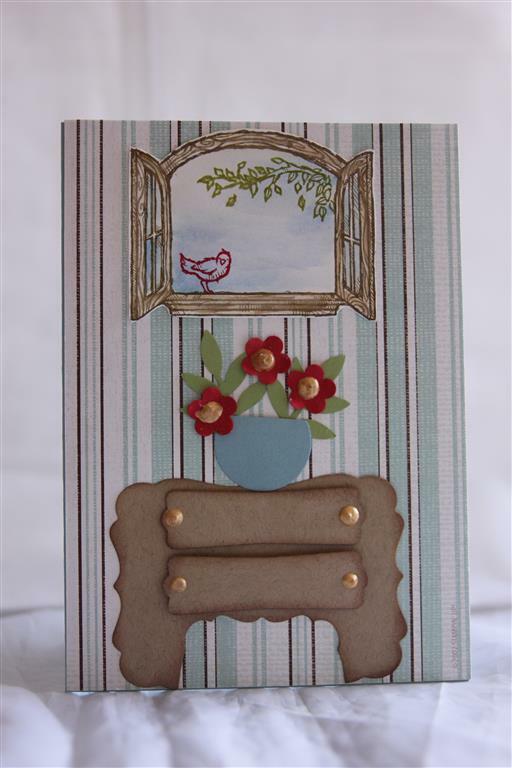 Kaisercraft Magnolia grove number 2… Again I have used the 12 x 12 papers, and the matching collectables. The sentiment is Stampin Up perfectly penned ( love that stamp) and in the top corner I have done a little arrangement with one of my hand crocheted doilies ( still learning – don’t look too closely) , ribbon, and prima flower and prima petals pin – these were new in my local craft shop the other day and I couldn’t resist them…. Til tomorrow…. Straight off I want to say that I found this paper a challenge – it is very pretty, but the muted colours are not what I usually choose, but learning is all about stretching yourself, so I will share my creations with you! I did make an initial 4 cards with this paper which sold before I could photo them, so some people do like this colourway. 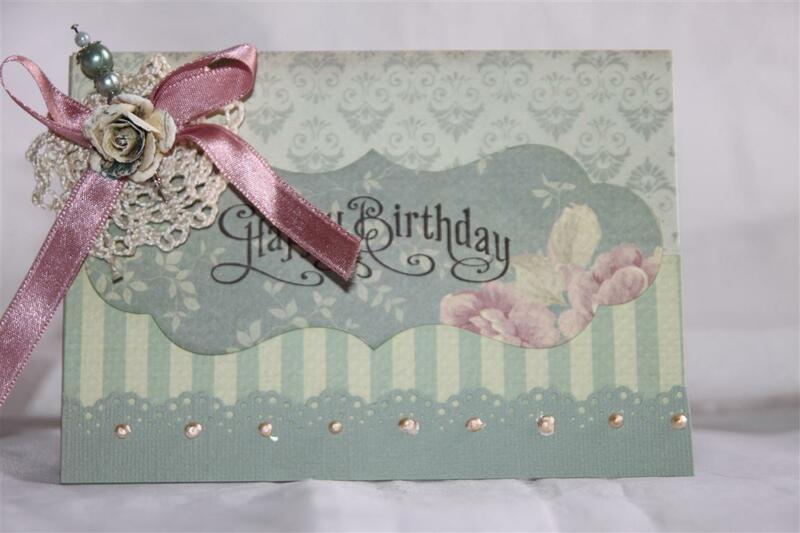 The paper is Kaisercraft Magnolia Grove, and I have also used the matching collectables, some kaisercraft pearls, lace, ribbon and websters pages clear rhine sparkler. The papers used on this one are all cut from 12 x 12 sheets. Til tomorrow…. I liked this paper when I first bought it, and I still like it using it for the second time around!It is Echo park Victoria gardens and I have lost count of the ammount of cards I have made with it. For this one I cut a cameo with my cricut machine and the heritage cartridge, made my flower using sizzix 3d flower die, tried out my new die from Die-namics – fancy flourish, and finished it by punching a border with martha stewart punch – lace doily and adding a little lace and liquid pearls. Til tomorrow….